You are here: Home / Great Deals / The Perfect Pancake (As Seen on TV) Only $10 + FREE Shipping (Reg. $20)! Wow! I am ordering this right now! I’ve actually been wanting one, believe it or not! 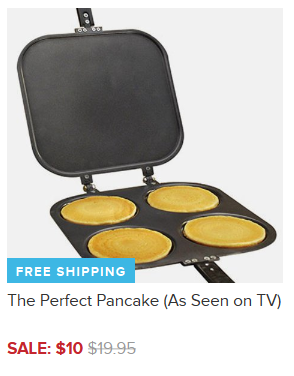 Right now we can snag The Perfect Pancake (As Seen on TV) for only $10 + FREE Shipping (Reg. $20)! It makes 4 perfect pancakes at once – what a time saver!! Estimated delivery: 12/24 – 12/31.